I’m going to make an effort to post more material to the site. Though I stopped doing a weekly cartoon a while back – after two years – I am working on some things and will share the sketches and ideas here from time to time. Hopefully this will inspire to produce more work. In the meantime, here’s the cover for the second Jack Quasar book. I’ve got the story and pages plotted, but can’t seem to get motivated to actually WORK on it. The following is from the back page of my comic book. and find out how to order a PDF. 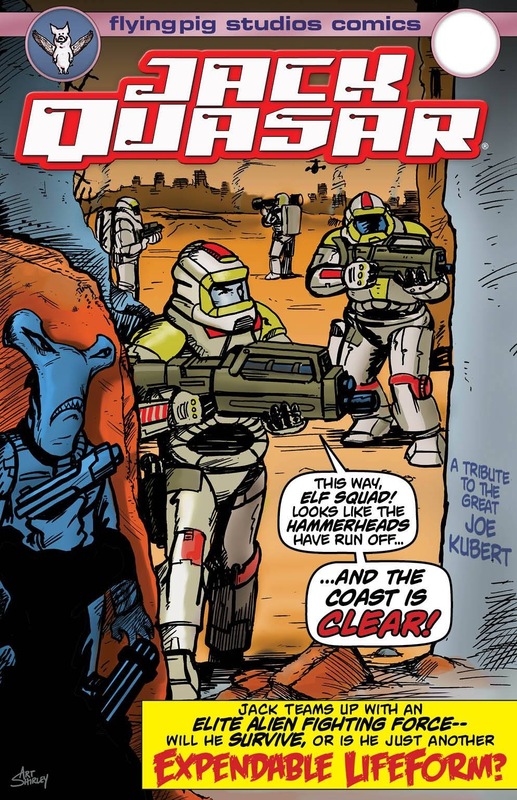 Jack Quasar was created in 1977 as a tribute to Buck Rogers, Flash Gordon and more contemporary influences, Star Trek and, of course, the just-released Star Wars. My initial idea was a “James Bond in space” and in fact, the original title was Jack Quasar, Man from S.P.A.C.E. I never came up with anything I liked for those letters to stand for and with a couple of exceptions, Jack was more space cowboy than spy. In the fall of ’77, my family moved from our hometown of Leland, Mississippi to Long Beach, Mississippi, and it was there that I started drawing Jack Quasar. Jack’s adventures took place in a series of letters to a childhood friend, Walter McWhorter, who shared my love for sci-fi and comics. This was before email, computers or scanners, and I kept no copies. Fortunately, Walter did, so I still have some of those early stories. The adventure presented here is supposed to be the first Jack Quasar story. It’s actually the third time I’ve drawn the story, and I’ve finally gotten around to adding some of the details that have occurred to me over the years. I’d like to point out that the story as presented here was written in October 2010, long before Ridley Scott’s Prometheus movie was announced. There are a few plot points that are coincidentally similar, but I don’t flatter myself that anyone would ever confuse my work with his. That said, there’s nothing particularly original about this story or the characters, and I made no real attempt to hide my influences. (See what “homages” to popular culture you can find.) This was done for the fun of revisiting this character, and on that level, if no other, it succeeded. 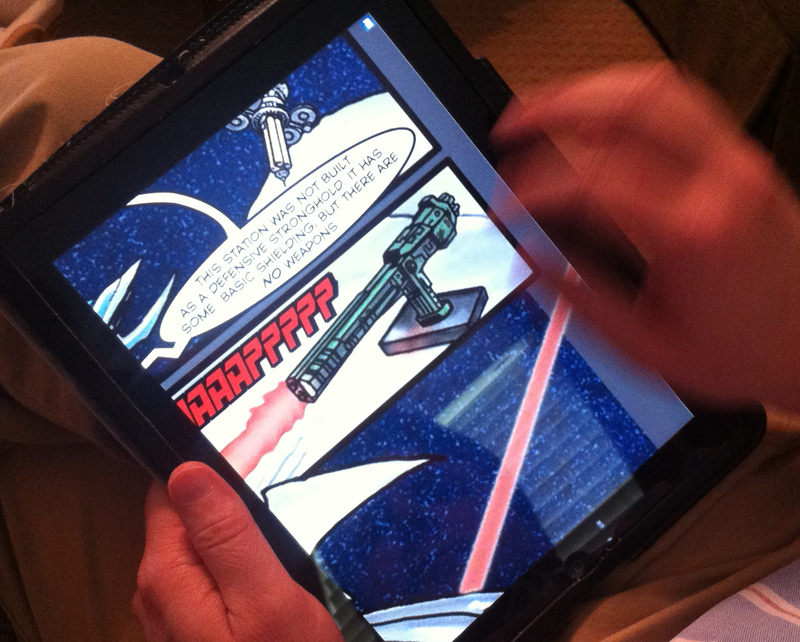 Checking out the comic book on the iPad. Finally finished the Jack Quasar comic book this past Saturday, had Will proof it, and uploaded it to the on demand printer, Comixpress, on Monday. I’ll have some copies for family and friends who’ve contributed to or inspired the story in some way or another, and may offer it for sale online, if there’s anyone that’s interested in owning a printed copy. I’m including a link to download a screen rez pdf if anyone would like to look at it first – before or instead of getting the printed copy. As I mentioned in an earlier post, this has taken longer than I thought, but it’s been a fun project, and I’ve learned some things in the process. One of the main things I’ve learned is that this doesn’t come as easily to me as it once did. I’ll apologize up front for the often sloppy drawing and the inconsistency of style throughout the book. I rushed through some pages, and it shows. Being colorblind produces some occasionally bizarre coloring results, as you’d imagine. I’d also apologize for using too many computer tricks and shortcuts, but I’ve worked with deadlines too long to worry too much about something that makes your job easier or allows you to do things faster. My father loved to tie things into important dates in his family’s lives. He would start something on someone’s birthday or try to complete a project by a certain anniversary. He would have appreciated the fact that I finished this story-a story about fathers and a story that he, as my first and best hero, helped inspire-just as we mark the third anniversary of his death. Thanks to those of you who’ve shown interest and support, not just on this, but all the other random things over the years.